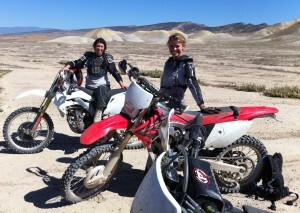 I constantly wonder why more girls don’t dirt bike. Why more people don’t dirt bike, for that matter. Yes, it’s expensive, it’s noisy and dirty, it’s incredibly physical and it’s certainly not a ‘peaceful’ wilderness experience… but once you know how it feels to power up the impossible, speed along on narrow ridge lines and flow through dreamy single track… you too will be hooked. 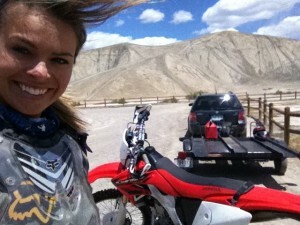 Keeping Up With Ramona – Dirt biking from Ramona Bruland on Vimeo. 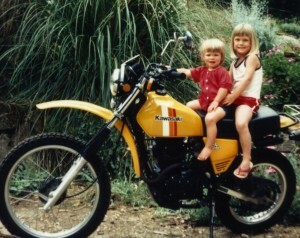 My mum and dad both rode motorcycles for as long as I could remember. I was that little 8 year-old that got picked up from school or gymnastics by a leather-clad Motor Momma. Yep, my mum was cool. 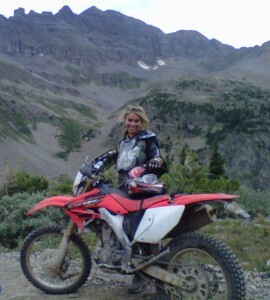 I didn’t start riding myself until 2007 when I did a Plum TV segment on a former Telluride motorcycle/snowmobile shop called To-Hell-U-Riders. If you scroll to the 5 minute mark of this video, you’ll get to see former shop owners Paul Russell and Suzie Schaefer-Russell hit up the endless network of beautiful tacky trails in the Montrose Adobe Hills, in southwest Colorado. These became my shredding grounds for the next 4 years and are seriously some of the best riding in the States. 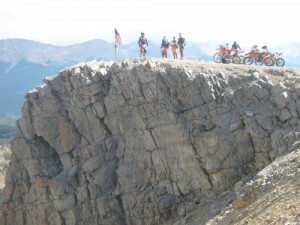 From hill climbs to narrow canyons and rolling ridgelines, Flat Top and Peach Valley is an amazing destination for a weekend of dirtbike camping. If you have made the choice to live in a ski town, you probably have a passion for adventure, the outdoors and maybe even speed. Mix that with time on your hands and an obsession with new toys, and you’re probably ripe for a dirt bike addiction. Basically any ski or snowboard junkie qualifies. 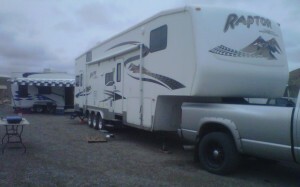 The best part of my weekends away dirt bike camping is that it’s a family affair. Husbands and wives, daughters and friends, ski town bachelors-for-life and your general dudes that rip (and can fix things.) That’s the hardest part about being a girl learning to ride… if you don’t have a support team of tinkerers that can fix/haul/lift/start and encourage, you’ll never make it out of the parking lot. A common misconception is that dirt biking is easy because you have a motor to do all the work. Until you try it, you’ll never understand the physical challenges and incredible fitness that is required for this sport. Ladies, this is one of the best workouts you will ever find. Try a 100 miler then see if you can walk the next day. So why don’t more girls ride? Well, a general rule of thumb is if you can’t pick up your own bike, then you shouldn’t be out there. When you first learn to ride, there will be a few hard knocks. The adrenaline induced super human strength that kicks in allowing you to lift your 250lbs (113kg) bike out of gulley’s and ditches, only lasts so long before utter exhaustion sets in. So this is certainly not a sport for the weak or faint of heart. At the end of the day, you get to rip off your gear, grab a beer and enjoy the fireside antics of good food, friends and conversation under the stars. Actually the beer doesn’t even have to be that cold, nor the food any good, because after a day of riding it’ll be the best thing you’ve ever tasted, regardless. Very few of us will ever take the sport to competition level. Working for X Games at ESPN I got to see first hand some of the best dirt bike athletes in the world. From the edge of-your-seat battles in Step Up, to girls like Laia Sanz dominating the competition in EnduroX and Vicki Golden medaling against the boys in Best Whip, the boundaries of where the uber talented can take this sport is endless. Remember Travis Pastrana’s first ever, double backflip on a dirt bike back at X Games in 2006? The impossible is never impossible. 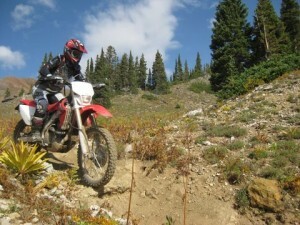 Finally, if you’re still unsure you’ll like the sport then next time you’re in Aspen, CO take a day to go ride with Kiko Trincado at Aspen Dirt Bike School. You won’t be disappointed. Hey Hon … thanks for your link … i watched the dirt bike riding video, is that an old clip i notice you have Barrett there with you ? All good to me … would love to try that sometime too ! !